Your ongoing generosity can support In A Heartbeat in fulfilling its mission to provide AEDs to deserving organizations throughout the U.S. Use the form below to establish a recurring donation to In A Heartbeat via PayPal. 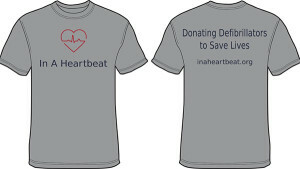 All donors to the In A Heartbeat Project will receive a complimentary t-shirt. How often would you like this to recur?